Chelsea Reignite Interest in Serie A Star Midfielder As Contract Talks Stall; Good Move From Conte? Various reports are indicating that Chelsea are plotting a move for AS Roma midfielder Radja Nainggolan in the upcoming January transfer window. The 28-year-old has been on Chelsea’s radar for over a year now with numerous attempts to bring the midfielder to Stamford Bridge failing. Nainggolan has been in contract talks with Roma over the last three months but a signature hasn’t yet worked out and the talks are stalled. According to Belgian Newspaper Het Nieuwsblad, the midfielder is now fed up with waiting and will look to leave Roma. This will surely reignite Chelsea’s interest in the player and with Cote planning a major overhaul in the winter, Nainggolan could be Chelsea’s first target. Chelsea will reportedly see a mass exodus in the winter, which includes the likes of Cesc Fabregas, John Obi Mikel, Branislav Ivanovic and more. The midfield position will be pretty much there for the taking for Nainggolan and given his age, he looks to have both the experience and maturity to break into the first team. The Belgian is a brilliant player with supreme technical ability with the ball. Chelsea at present rely highly on Nemanja Matic and N’Golo Kante for the midfield positions and it is quite clear that they don’t have potential players to replace the duo in the case of injuries or suspensions. A player of Nainggolan’s calibre will surely level up their midfield contribution. The Belgian has garnered a lot of praise for his passing prowess and the ability to hold the ball. He has produced some of the most sublime finishing in Serie A in the past few seasons from deep midfield and there is absolutely no doubt in his goal scoring proficiency. He has made 11 appearances this season already scoring one, creating 15 chances and one assist. Nainggolan has completed 352 passes with a pass accuracy of 78%, of which 77% were forward passes. However, one major concern will be the Belgian’s height. At 178cm and 65kgs, he certainly lacks the physique when compared to other title contenders in the league, who have the likes of Henderson, Xhaka, Elneny, Yaya Toure, Pogba, Wanyama, and Fellaini. Chelsea are currently top of the table and their exclusion from Champions League and EFL Cup have helped them to a certain extent in terms of keeping their players fit. They could be real title contenders if they could carry on their present form into the second half of the season, where squad depth will be quintessential. Predicted 5-4-1 West Ham United Lineup Vs Manchester United: Can Bilic Pull Off Another Upset? Newcastle United Will Have To Break Bank For 22 Y/O Brazilian Winger: Can Benitez Get Him? Chelsea In A Groundbreaking Deal For Multiple World Cup Winner – What Does It Mean For The Blues? French Heavyweights Join The Race For The Signature Of Chelsea Man: More Headache For Sarri? Chelsea Refuse To Sell This English Winger This Summer: A Risky Decision By The Pensioners? 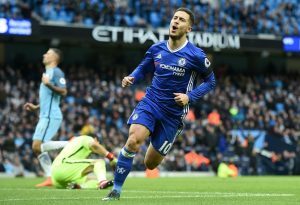 Return Of The Beast: Where Will This Star Slot In The New Chelsea System?